If I’m honest, I’ve never fully understood the appeal of Vox Continentals. Coming to prominence in the second half of the 1960s, their brash, reedy sounds neither emulated the tonewheel organs of the era, nor were they as suitable for psychedelia as the Farfisa Compact models. Nevertheless, they’re often ranked as the most important and influential of all the combo organs, and when a family of instruments is adopted (no matter how briefly) by the likes of the Beatles, the Monkees, the Animals, Terry Riley, the Doors and the Grateful Dead, you’ve got to respect its heritage. Unfortunately, many surviving Voxes have been poorly (if ever) maintained and, as a consequence, they can be unreliable beasties. If I leave mine untouched for a few months, it becomes prone to mistriggering, with intermittent notes, a scratchy key–on noise, and a high probability that assorted harmonics on various notes will go walkabout. Playing it then becomes an exercise in avoiding the notes that go ‘peep’ instead of ‘parp’. What’s more, the tone generators have a tendency to stop dividing, so that lower octaves of a given note (and their related contributions as harmonics) can also disappear into the aether. If you’re lucky, these are not difficult repairs but, for serious players, maintenance is vital if a ‘Connie’ is to remain reliable and consistent over long periods. 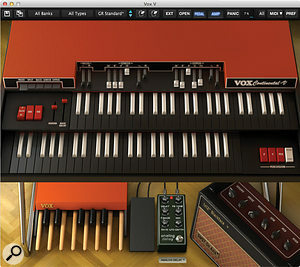 Clearly, in this era of software synths, organs and pianos, there’s a place for a modelled Vox Continental. The only question should be, ‘does it do the job?’. Installing Continental V was a doddle and, because it’s a model rather than a sample library, it takes up less space and loads much more quickly than you might imagine. Having got it up and running in a handful of minutes, I connected two Arturia AE USB controllers to my Mac and directed these to the upper and lower manuals, and was ready to start. The next thing to do was to link the physical knobs and sliders on the keyboards to the controls on the GUI and save this as a configuration. You can assign a MIDI CC to every control within Continental V, and the software not only allows you to constrain the MIDI CC values to sensible ranges, but also to reverse the effect of your controllers’ sliders so that they act as drawbars (toward you to increase values, away from you to decrease them) rather than in the normal fashion. Arturia’s standard preset management system is retained, so it’s easy to create, save and recall your own setups and registrations, even down to the colour of the Tolex for a given preset. Unlike some hardware emulations of recent years, the GUI for Continental V follows the form and function of the original instrument (in this case, a Continental 300) closely. The original offered drawbars for 16’, 8’, 4’, and mixtures II and III on its upper manual, drawbars for 8’, 4’, 2’ and mixture IV on its lower manual, drawbars for 8’, 16’ and a release option for the bass, and additional drawbars that controlled the contributions of the Flute (sine) and Reed (filtered square — essentially, triangle) wave generators for each. Upper manual ‘percussion’ was also available, and all of this appears to be recreated correctly. Encouraged by the accuracy of the GUI, I compared the sound of the software’s raw waveforms (8’ drawbar, no effects) with those generated by my Continental II, and found the two to be only slightly different, perhaps due to degeneration in the components in my old beastie. A more significant difference lay in the nature of the V’s vibrato. This is an important element in the ‘Vox sound’ and Continental V’s was initially shallower and slower than the original’s. In short, my Connie sounded brighter, brasher, and had an altogether stroppier attitude than Continental V.
Happily, a solution was close to hand. Opening the top panel of the GUI revealed the ‘tone generators’, which allowed me to dial in all manner of tweaks, including detuning of the individual divide–down oscillators, adding background noise, and causing notes (or footages within registrations) to mistrigger to a greater or lesser degree. There are also controls to adjust the vibrato speed and depth to emulate the aggressive effect on the original. I spent a few minutes adjusting all of these and found that a bunch of noisy, unreliable and mistuned notes that wobbled to an unpleasant degree was sure as heck starting to sound like a bag of bolts that’s approaching its 50th birthday. If I have to find a fault (and there is a small one) it’s that, while a key is depressed, there’s a low–level but permanently sustained note when using the percussion, even when no drawbars are extended. Perhaps this was a characteristic of the Continental on which the software was based. 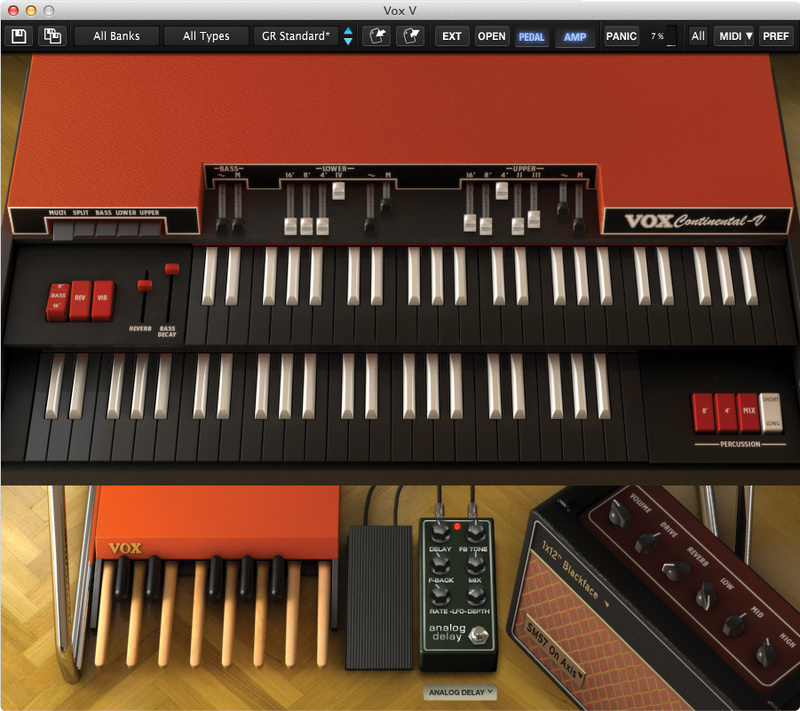 Expanding beyond its emulation of the original organ, Continental V also offers an Extended Mode that inserts additional controls into the GUI and adds a third waveform option to the sonic palette. (See the ‘Extended Mode’ box.) Called ‘S’ (for ‘String’) the new waveform is described as a triangle wave, but it’s much brighter than that, and an oscilloscope revealed that, at low frequencies, it’s closer to a ramp wave, which has the same harmonic content as a sawtooth wave. This is as it should be: you almost always start with a sawtooth wave to create string sounds. Now, forgive me if I stray from the main narrative for a moment. Following long–term financial difficulties and a buyout in 1967, Tom Jennings (the founder of Vox and the co–designer of the Continental organs) was laid off by his own company, so he founded Jennings Electronic Instruments (JEI) and, over the next few years, manufactured a small range of organs in direct competition with his previous employers. In large part, these were based on his Vox instruments, but with more drawbars on the upper manual (identical, in fact, to the Extended Mode on Continental V) as well as some presets. The J70 was the dual–manual model, but the pick of the bunch was the rare, triple–manual J71, which added a bunch of confusing mixtures, sustains and tone controls for its new upper (as opposed to the now middle) manual. Given the speed of development in the late ’60s, it should come as no surprise to learn that there were some underlying electronic differences between the Continentals and the ‘J’-series organs so, while it seems that Jennings was aiming at the same sound as before, his new instruments had a slightly different character. To my surprise, Arturia have emulated this by providing a knob that allows you to switch between two sound ‘engines’ — Vox and Jennings — either of which can be invoked in standard and extended modes. So, while I still had the Continental II and Continental V set up next to each other, I brought in my J71 on this for further comparison. Despite the differences between the two organs (for example, the choice of harmonics comprising the mixture IV drawbar on their lower manuals is different) there was more than enough that’s common between them to demonstrate that the Jennings tends to sound a little thinner and harsher than the Vox. For some reason, I had expected the Jennings engine in Continental V to be less accurate than the Vox engine but, tonally, it was definitely in the right ballpark, especially at low amplitudes. Nonetheless, there are two glaring differences between the original and the emulation. Firstly, neither the standard nor extended modes accurately reflect the voicing of the J–series, although the latter is correct for the upper manual. (Actually, it’s correct for the middle manual of a J71, but let’s not be pedantic about such things.) Secondly, when I pull out lots of drawbars on my Jennings it ‘crunches’, while Continental V remains clean and smooth at all levels. This may be in the nature of the original, or it may be a fault that’s existed for so long that I’ve forgotten how it once sounded, so I’ll say no more about it. There’s one other difference worth noting. When using the Vox engine, none of the tone drawbars (Flute, Reed and String) need to be extended to hear the percussion; when using the Jennings model, one or more do, and the amplitude of the percussion is proportional to the amount by which they’re extended. This means that you may not obtain the results that you expect when switching between engines. Given how much fun I was having playing the genuine Continental and J71 together, I next loaded two instances of Continental V into Digital Performer to recreate the experience. Or, rather, I didn’t. Although my version of DP recognised the plug–in and loaded both instances, it failed to display their GUIs. I then turned to Plague Bidule, which is a useful toolkit in such situations, and loaded two instances of Continental V into this. This took just seconds, but I then lost an hour or two playing with alternative tunings and different vibrato settings in each instance. This allowed me to create all manner of organic and shimmering organs that have never existed in the physical world, and the results could be much classier than passing the output of a single instance through a chorus unit. Ah yes... chorus units and other such things. Continental V offers a plethora of effects processors, although it’s not quite as flexible in this area as I had expected. The first three are built into the organ itself. These are vibrato, tremolo, and an emulation of three spring reverbs that Arturia call the Spring King, the RV–1 and the RV–2. Whatever their provenance, all three work well, although they are more polite than the twangy slap of the genuine spring reverb in the J71. Next, alongside the swell pedal within the GUI, there’s a single slot into which you can insert a ‘virtual stompbox’ of your choosing: a flanger, a phaser, a stereo chorus, a delay with an integrated LFO for further modulation effects, an overdrive, and a wah pedal. If these appear familiar, that’s not surprising — they’re a subset of the effects found in the Wurlitzer V software instrument from the same company. But unlike Continental V, Wurlitzer V offers a ‘board’ with five slots, thus allowing you to build the type of effects structures that you might have used with instruments such as combo organs or electro–mechanical pianos in the 1970s. I have no idea why Arturia’s engineers removed this from Continental V.
At the end of the signal chain lie three additional options that allow you to direct the output, umm, well... directly to the output, or through a rotary speaker effect, or through a guitar amp/cab model. I was relieved to see that, on the last of these, all four microphone options and all four amp/cab options have been retained from Wurlitzer V. It was quite common for Continentals to be amplified using cheap PA stacks or expensive guitar amps, and one played through a WEM EP40 and 2 x 12 sounds quite different from one played through a 100W Marshall stack. If there’s a disappointment, it lies in the Leslie effect. This appears to be a dual horn/rotor emulation, but there’s just a single rate control for both, and no way to control their accelerations. Consequently, its output sounds little different from one of the baby, single–rotor Leslies. I hope that Arturia addresses this soon, because I made the same comment when I reviewed Wurlitzer V in 2012 and, in my view, it’s even more important now that the effect is implemented within an organ emulation. If you’re an experienced Continental or J–series player you’ll find that, like the originals, Continental V has no trouble making itself heard in a mix. Sure, it can be polite, but pull out the Reed and String drawbars and some of the mixtures, and it will cut through in classic Vox fashion. You’ll also be pleased to find that you’re no longer bumping your fingers against the drawbars. This was a flaw of many of Jennings’ designs, whereby the drawbars, when fully extended, protruded above the keys. If you knocked them while playing (and everyone did) the sound became quieter and changed tone, so that’s a significant bonus when using Continental V.
But let me summarise how I feel about Continental V as follows... During the course of this review, I liberated one rather bulky and moderately heavy combo organ from storage, and then an even bulkier and ridiculously heavy combo organ from storage, serviced the former (the Vox) because it had lost all of the Ds in its lower octaves, carried them up (and later down) numerous flights of steps, and played them for a good few hours until all the notes and harmonics were triggering correctly. Only then was I able to start reviewing and writing, so I was quite keen for Continental V to come up to scratch. To be fair, it isn’t a perfect emulation of either of the organs against which I compared it, but I would have been gobsmacked if it had been. Vintage (or, to put it another way, old and tired) electronics can interact in unexpected ways, and the differences between the original organs and the software were smaller than I had expected. Sure, Continental V has a couple of bugs, Arturia missed the fact that the Jennings’ mixture is voiced differently from the Vox’s, the Leslie effect doesn’t live up to the standard of the rest of the package, and I was disappointed to find that it has lost Wurlitzer V’s five–slot pedalboard, but it does the job it was designed to do and, although it doesn’t always have quite the bite of the original, I would be happy to substitute it for the ‘real thing’ if there was ever a call to do so. All in all, I think that that’s a pretty significant ‘thumbs up’. There’s just one remaining problem. Continentals look damn cool on stage, so who’s going to build a dedicated MIDI controller for Continental V? The Continental V manual mentions four Vox models: the original, single–manual Continental (sometimes called the Continental I) first introduced in 1962, the dual–manual Super Continental, the Continental 300 (which added presets and an internal spring reverb to the specification of the Super Continental and related models), and the Continental Baroque with its integrated amp and speakers. Nevertheless, there were others. Some, such as the single–manual Continental 301H made by the Thomas Organ company in the USA, are easy to identify. (In this case because it used Thomas’s tone generators rather than Vox’s.) Elsewhere, the names and dates of the models, as well as what was built where, can be less clear. In particular, the Super Continental (which was the Italian version) boasted variants called the Continental II (the English version that I’ve used for comparison in this review) and the Continental Super II, which seems to have been an English Continental II with percussion. (So I guess that mine is actually a Super II, even through there’s no mention of it being Super on the organ itself.) There were also two console models; the Home Club Continental for the domestic market, and the ‘split’ Continental 301 for gigging. And let’s not forget the Continental Futura, which was a hybrid of the Continental II and the (now super–rare) Vox Riviera organ, and was built only to special order. In addition to adding and reallocating drawbars, Extended mode adds the String waveform to all three manuals (upper, lower and bass), adds a tremolo on/off switch to the control panel, and alters the percussion options. It’s simple, it’s flexible and it sounds like a Vox. If you ask nicely, it also sounds like a Jennings. It weighs nothing, and the keys trigger every time. It’s a shame that Arturia removed the pedalboard used on Wurlitzer V.
The Leslie effect doesn’t pass muster. There are a couple of small bugs to be swatted. One of two things is happening. Either I’m becoming less grumpy in my old age (unlikely) or soft synths and other ‘soft’ instruments are becoming damn good. In the past couple of years I’ve threatened to retire my Wurlitzer EP200, Philicorda and Clavinet in favour of software instruments, and now I have to add my Vox Continental and Jennings to the list. Continental V isn’t always indistinguishable from its inspirations, but I’m not sure that I care enough about the differences to continue maintaining and carrying the originals around. MacBook Pro 2.5GHz Core i7, 16GB RAM. OS 10.7.5. Continental V Version 1.0.0 (64–bit). Plogue Bidule 0.9726 and 0.9737.